Typical layout with expansion joints and proper guide spacing. 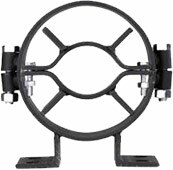 Recommended maximum spacing of intermediate pipe guides for applications involving axial movement only. Special pipe guides not listed are available upon request. Use the 1″ thickness column when no insulation is required. Copper tube guides require dialectric spacers. Pipe Alignment Guides should always be used in conjunction with expansion joints. Pipe alignment guides help to control the motion of pipe and expansion joints, insuring that the joint is subject only to the deflection for which it was designed. Unguided piping, under pressure, will tend to buckle, sometimes severely. This buckling would deter the expansion joints from working properly. Guides permit unobstructed axial movement of the pipe while restricting lateral, angular, or buckling movements. Standard spider guides are manufactured to accommodate specific amounts of movement and insulation. A pipe guide assembly consists of an anchored housing as the pipe expands and contracts. Guides are carbon steel painted for rust protection. Additional items in this series include pre-insulated guides, pipe slides and bases, anchor clamps, baseboard fin-tube guides, baseboard anchors, and hinged series. It is recommended that an expansion joint be located as near to an anchor as possible. The first guide* should be located within 4 pipe diameters of the expansion joing (see Figure 1). The second guide should be located within 14 pipe diameters of the expansion joint. The remaining guides are placed at the appropriate distance shown in the INTERMEDIATE GUIDE SPACING CHART (see Figure 2).